Selected work from my professional portfolio. After a year of rapid growth, a digital creative agency in Portland, OR wanted to leverage their strong culture to increase operational efficiency and develop their talented doers into leaders. My colleagues and I engaged with them across all levels of the organization. After interviewing stakeholders and identifying opportunities, we implemented a capacity building program at the individual, team, and organizational levels. This included individual coaching and group workshops, facilitated project reviews and interactive sessions with teams to improve dynamics and increase collaboration, and the redesign of organizational systems including the on-boarding and employee review process. Learn more about this project in this article published in the Design Management Review. A causal loop diagram that maps the relationship between the creative process and team dynamics. My team and I worked with a geographically diverse and expanding design-build firm to increase their growing staff's ability to authentically represent the brand. We developed a strategy for internal brand cohesion that focused on integrating a deep sense of the company into specific organizational systems and critical touch points throughout each employee’s experience. A tool I designed to map and design for an employee's experience at the company. The group preparing for our first session together. The team documented much our work together over the month. A team of four co-founders of a digital community for designers were in the same location for an entire month and asked me to help them grow as a team, focus their business model, and develop a growth strategy for the next year. I led them through a series of sessions that were designed to increase their cohesion as a team while leveraging this critical time together in one place to design a business model and architecture that would allow them to grow their business and work effectively together once they returned to their respective places. I worked with a pair of start-up co-founders to help them develop a focused business model that would activate their bold concept and engage their inspired community. I led the partners through a series of exercises and engagements that defined their vision and core organizational philosophy, strategically focused their business model, and implemented key components of their organizational architecture to leverage short-term opportunities and build toward their long-term vision. A simple model for how organizational philosophy, business model, and architecture relate to and support a brand. 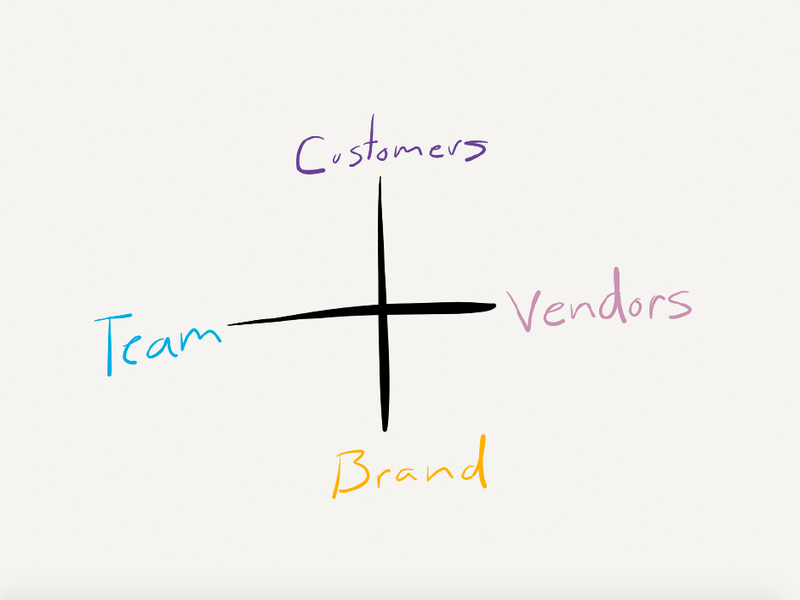 A sketch of the four way relationship between the internal team, customers, vendors, and the brand. A home goods and lighting company was growing faster than their vendors could adapt to and it was putting strain on the team and brand. The company faced a challenge because they had built their unique brand through their relationships with small unique vendors. I worked with the leadership team to design ways to bring collaboration into the supply chain by designing what we called a partner platform that would allow for vendors to be able to scale with them while staying true to the customer facing brand that was fueling the growth. This platform was a series of new and adapted systems that helped increase the efficiency and health of operations and relationships among the team, vendors, customers, and the brand. 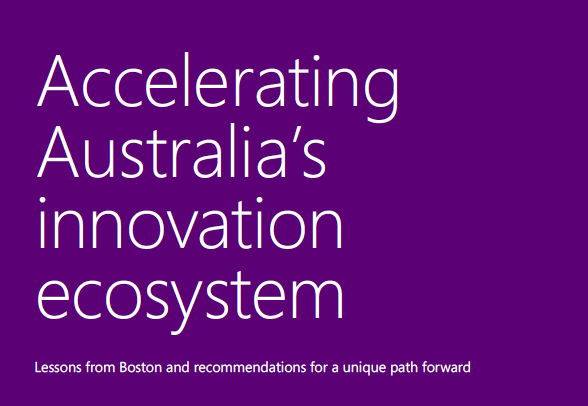 I was asked by a global tech firm to lead a conversation among Australian stakeholders during their visit to Boston to learn about the innovation economy in Massachusetts. I designed and facilitated a conversation that focused the groups recent experience and learning on specific actions that each participant and their respective organization would advance when they returned home. The cover page of a report developed by the client and convener of the Australian delegation. 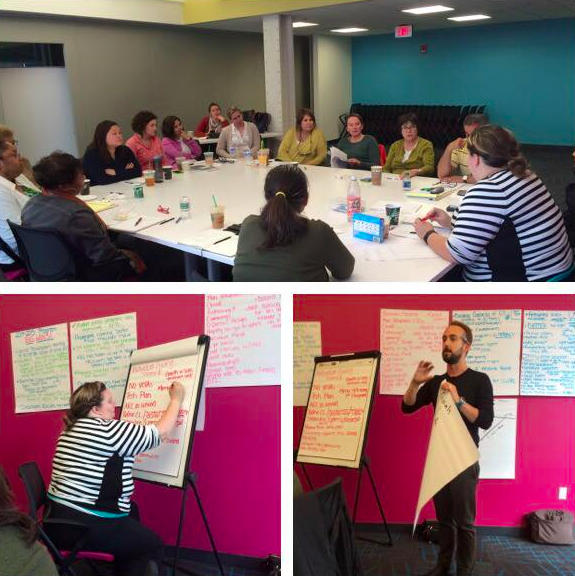 Photos from the annual retreat. An established children’s literacy non-profit asked me to facilitate their annual staff off-site retreat. I designed and led an experience that brought all voices to the table, allowing for sensitive-conversations to become productive dialogue. This engagement created the conditions for the organization to effectively execute their strategic plan and navigate multiple leadership transitions over the next year. Activities and exercises throughout the day were designed to engage the group in dialogue, increase their understanding of one another, and decide on specific actions that they would take in coming months. In 2008, my friend and I developed and managed a co-working and incubator office space in our hometown in Western Massachusetts. We discovered that there was an abundance of unused commercial real estate and also a growing community of freelance and start-up professionals. We designed, built, marketed, and managed the space over the course of three years. Our space was designed to feel robust and permanent while being able to adapt to quickly to new uses and layouts while we prototyped the model and built the community. A photo of a second generation workstation in the space. These workstations had Teflon pads on the legs so one person could easily move them and reorganize the space. A photo of Shelburne Fall, MA - the town at the center of of the region we mapped. As part of an economic development effort in the region, I worked with a team to audit unused commercial real estate properties and define opportunities for innovation and growth. I mapped and documented properties, interviewed stakeholders in the community, and worked with a team to develop a vision and strategic plan. A photo from the Wallowa Mountains in Eastern, OR - a landscape that exists within the greater region the organization works within. I worked with an non-profit organization that helped solve natural resource conflicts through collaboration in the west. My role was to work with a wide range of partners and stakeholders to communicate the impact of our collective work in the region. I engaged diverse stakeholders, developed ways to visually communicate complex stories, increased digital media presence and relevance, managed outreach to the media, and led a re-design of the organization's website.